GAM Enterprises, Mt. Prospect, IL, introduces lightweight, compact and durable couplings promising to ease sectional gripper-rail attachment in transfer systems. The couplings, designed by Jakob Antriebstechnik GmbH and currently used on transfer systems in Europe, can be retrofitted into existing systems or installed by the transfer-system OEM. The couplings are the only units available that provide vertical separation, says Gary Michalek, GAM Enterprises CEO, with horizontal separation also offered. Clamping force is achieved manually via a hex-head nut, or pneumatically. The horizontal version offers pneumatic operation—a key feature, according to GAM Enterprises design engineer Mark Ruggles. Hydraulic couplings can leak, he notes, causing oil to drip or spray onto parts, equipment and the floor. In addition, “the horizontal couplings are designed so that, in the event of an air-pressure loss, the transfer rails will stay secure with a minimal loss of holding capability,” explains Ruggles. All couplings are controlled electrically to monitor clamping status, and fit directly to current gripper rails or through the help of adapter plates. Designed to provide easy separation to speed changeover, the couplings can be outfitted with additional electrical and air connections to simplify installation. The vertical coupling Model PKV consists of active and passive parts made from tempered steel to provide corrosion protection. Clamping force is generated in the active part via a combination of an axially sliding locking bolt and a mechanical clamping gearbox. This design allows for high clamping forces and dynamic stiffness while keeping weight at a minimum. For tool changing, a vertical stroke is required. 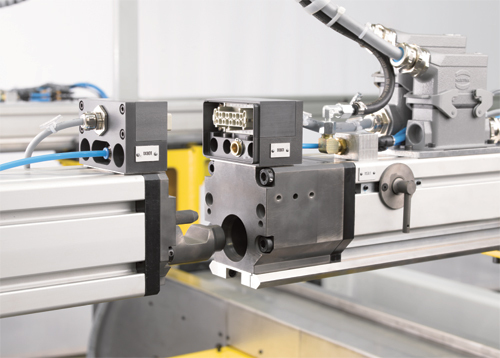 Model PKV is available in two versions: the fully automated pneumatically driven PKV-P and the manually operated PKV-M. The Model PKH horizontal coupling, also available as a fully automated pneumatically driven model and as a manually operated model, also consists of active and passive tempered-steel parts, with a portion of the unit constructed of aluminum. In the active part, clamping force is generated by the use of a vertically sliding clamping pin in combination with a coupling pin in the passive part. The couplings feature patented force amplification via a wedge clamping design, and can compensate for a gap as large as 5 mm between the active and passive parts of the coupling. See also: GAM Enterprises, Inc.